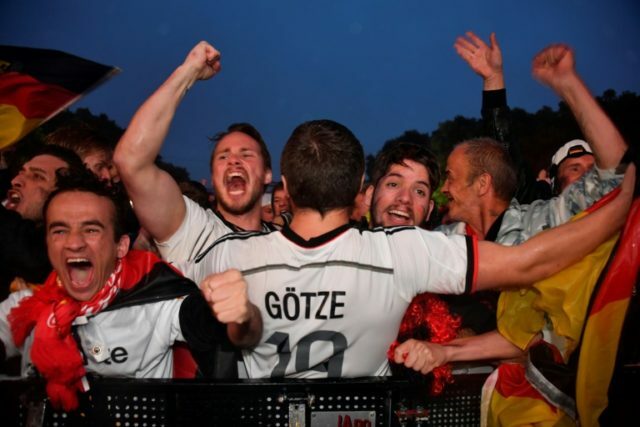 Berlin (AFP) – Fans danced in the rain in Berlin on Saturday as defending champions Germany avoided an embarrassing World Cup exit with a 2-1 win over Sweden. Supporters watching on big screens at the Brandenburg Gate huddled nervously under grey clouds and drizzle, before throwing their umbrellas away as Toni Kroos’ late winner saved Germany. “I’m so, so so happy,” screamed Rasdan Abdullah as the final whistle sounded in Sochi. “It’s a great feeling,” said Birgit Schlag, who had come to Berlin to see the Rolling Stones in concert the day before. The rain had just begun to fall in the German capital as Ola Toivonen fired Sweden ahead on the half-hour mark, and grey clouds lingered as the crowd sung “You’ll Never Walk Alone” at half-time. They breathed a sigh of relief when Marco Reus equalised just after half-time. And when Kroos curled in a free-kick in the fifth minute of injury-time, the fans were in ecstasy. “I said before the game that Reus would score,” said a beaming Dieter Mann, a 60-year-old tour guide with Germany flags stuck to his head. “Defeat for us today was about as likely as England winning the World Cup,” said 37-year-old jobseeker Marcel Kreisel, and fell about laughing. Having slumped to a shock 1-0 defeat against Mexico in their opening game, Germany had to beat Sweden to avoid elimination. With Mexico top of Group F after winning their second match on Saturday, Germany play South Korea on Wednesday knowing they must do as well as the Swedes against Mexico if they are to progress to the knockout round.